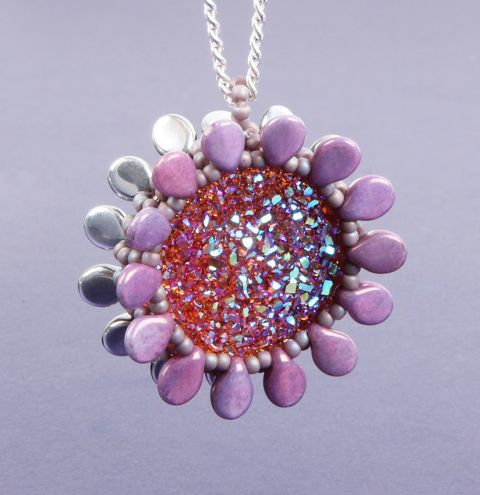 Design a sparkling double sided pendant using acrylic cabochons and pretty pip beads! Please note - materials make 1 x double sided pendant. Make a loop of 14 pip beads with 2 seed beads inbetween each. Knot the two ends of thread together and thread into the beads a little further to move away from the knot. Repeat this for the second colour of pip beads. Weave in 2 of your tail threads on one circle of beads and weave in 1 of the threads on your second circle of beads so you are left with 1 long thread to continue sewing with. Thread out of a pip bead, pick up 3 seed beads and thread into a pip bead on your second circle. Pick up 3 more seed beads and thread through the next pip bead on the first circle you started on. See image. This will start linking the circles together. Continue to link the circles. Pick up 3 seed beads and thread through the opposite pip bead on the other circle. Repeat a few more times. You can move the pip beads out of the way of your sewing for now, they will flip back into place in the next step. Take two of your acrylic glitter cabochons and place them flat sides together. Fit them between the two circles of pip beads that you are sewing together. The seed bead pattern you are currently sewing will sit around the edge of the cabochons and hold them in the centre. Continue sewing your top and bottom circles together, weaving in and out of the pip beads. Once you have finished the circle, your cabochons should be held in place in the centre. See image. Finally, sew to one of the centre beads around your design. This is the 2nd bead in a line of 3. Add a loop of 7 seed beads and thread through the same bead again to attach the loop. Reinforce this loop and weave your thread back into your design. Make small knots along the way and weave in and around the bead work to secure the thread. Trim off the excess thread when you are confindent the thread won't unravel and that your pendant loop is strong. Add a chain to this loop and your pendant is ready to wear!